These tangy drumsticks are so easy to make and, oh, so good! A change from the usual barbecue. Enjoy! Lightly oil grill and preheat to medium heat. Season drumsticks with salt and pepper. Heat oil in a sauce pan over medium heat. Add onion and cook, stirring often until translucent. Add ketchup, molasses, brown sugar, prepared mustard, Worcestershire sauce, and chili powder, stirring to combine. Reduce heat to medium low and simmer sauce until it thickens slightly, about 15 minutes. Start drumsticks while sauce is simmering. Grill chicken legs, turning to crisp all sides, until skin is crisp and juices run clear. This takes about 25 minutes, depending on heat of grill. When sauce is thickened, put half into a bowl. Set aside for dinner. 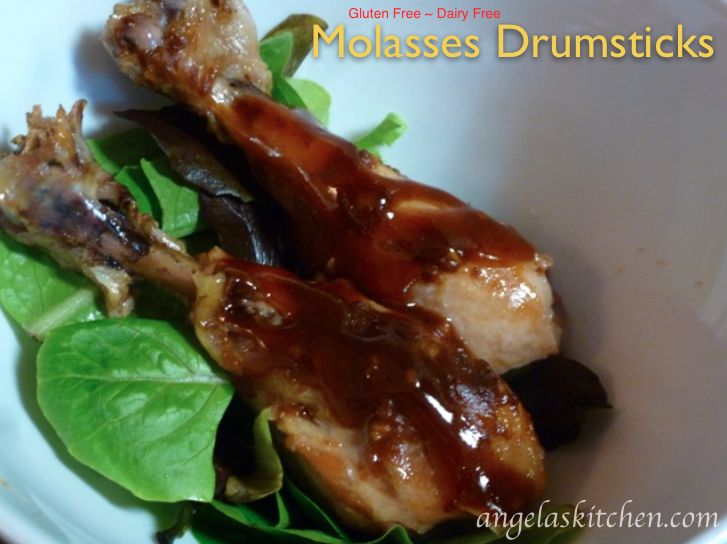 Brush drumsticks with remaining sauce. Cook drumsticks about 3 minutes more until sauce turns into a glaze. Remove drumsticks from heat, discarding remainder of sauce from sauce pan. To bake drumsticks: Preheat oven to 400 degrees. Line a rimmed baking sheet with foil and lightly oil. Bake for about 25 minutes, turning so all sides of drumsticks are crispy and until juices run clear. Brush with sauce and bake for 3 more minutes.